What is the new Henning’s Rollback Gas Rewards program? What if my Gas Rewards are higher than the cost of gas? What if my car holds more than 15 gallons? Do I have to redeem all of my Gas Rewards Points at one time? Will my gas rewards ever expire? What if I want to share with my family? How do I redeem my Rollback Gas Rewards at Ed’s Service Station? What gas station are participating? I went to redeem my rewards and they were gone. How could this have happened? Are there any limitations with the Henning’s Rollback Gas Rewards Program? Why is there a 15 gallon purchase limit? Q: What is the new Henning’s Rollback Gas Rewards program? Q: Will my purchases accumulate? A: Yes, your purchases will accumulate within the month. For each $100.00 you spend in one purchase or multiple purchases within the month time frame, you will receive $0.10 gas reward. Q: What if my Gas Rewards are higher than the cost of gas? A: If your Gas rewards per gallon exceed the gas stations price per gallon the remaining amount will then be available for your next gas purchase. The minimum you must pay is $.10 per gallon. Example: If you earned $4.00 in rewards and the price at the pump is $3.00 your card retains a reward balance of $1.10. Q: What if my car holds more than 15 gallons? A: The pump will shut off at 15 gallons and the Gas Rewards used during that transaction will be subtracted from your account. If you would like to purchase additional gas, you can do so by starting a new transaction. Q: Do I have to redeem all of my Gas Rewards at one time? Q: Will my Gas Rewards ever expire? A: Your total amount of Gas Rewards as well as the starting and ending date are located on the bottom of your Gas Rewards receipt. Gas rewards expire on the last day of the month following the month in which they were earned (redemption period), your account will be reset and any unused gas rewards will be lost. Q: What if I want to share with my family? A: You may choose to have all your Henning’s Rewards Cards linked together by household so that each member may have their own card and still earn Gas Rewards as a household. This also goes for redemption; any one of the card holders may redeem all of the accumulated Gas Rewards. Once one card uses the rewards all of the linked cards go back to zero and another earning period starts at the next store transaction. Q: How do I redeem my Gas Rewards at Ed’s Service Station? On the pump a message will flash and ask if you are a Henning’s Rewards member. Simply press the YES button. 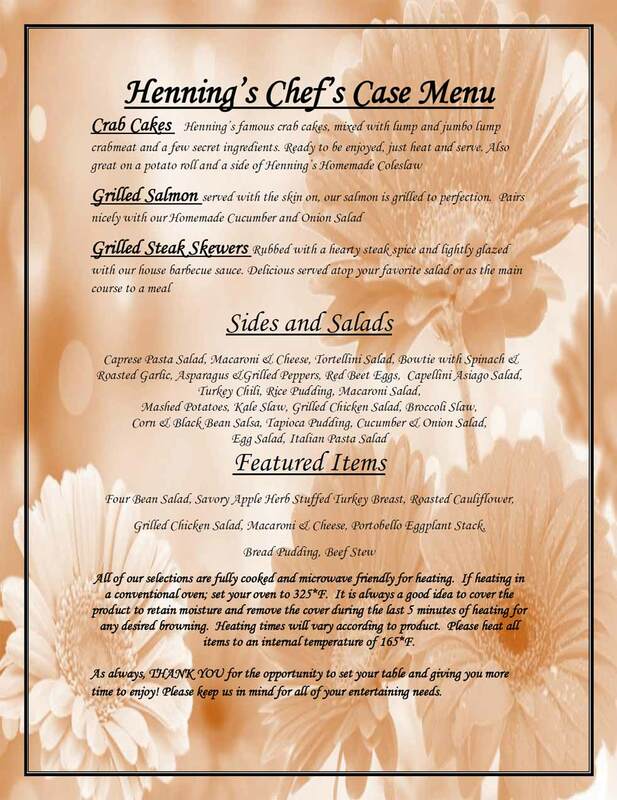 Insert your Henning’s Rewards Card. Insert your Credit or Debit Card as your method of payment. Select your grade, pump you discounted gas, and SAVE. A: This will enable you to take full advantage of all our reward programs. Q: Why do you need my phone number and e-mail address? Q: What gas station is participating? A: Our gas partner is Ed’s Service Station, located on route 63, across from the PA Turnpike entrance. Q: I went to redeem my rewards and they were gone. How could this have happened? The first one is that the rewards have expired. Remember that the rewards expire the last day of the month following the month in which the rewards were earned. Q: Are there any limitations with the Henning’s Rollback Gas Rewards Program? A: This program excludes all purchases of gift cards, money orders, and postage stamps, copy/fax services and all applicable taxes, as well as items prohibited by law, such as milk. Terms and conditions are subject to change without notice. You may only fill up ONE vehicle per redemption, up to 15 gallon maximum. You are also permitted to fill one container approved to transport gas, when filling your car. Q: Why is there a 15 gallon purchase limit? A: In areas that currently offer Gas Rewards it was found that average redemption and vehicle tank size make a 15 gallon limit very reasonable for the majority of customers. Our partners have tested high limits and found that gas was being dispensed in unapproved fuel containers that posed a hazard to the customer, our associates, and the environment. We can not ignore these safety concerns.